Almost two years ago, I decided to ignore the fact that my hips & bum look nothing like the models that sell skinny jeans. My changing post-partum body needed something more flexible than the denim I used to live in but I wasn't willing to wear my yoga pants out of my house unless I was exercising. I took a chance & ordered a basic dark wash pair online from Old Navy. I can't actually remember what they cost, but I think it was around $20. I was surprised that the Old Navy jeans fit so well when they arrived--I was honestly expecting my first online pants purchase to be a disaster. Though they have an elastic waist like leggings, the stitching & fabric is like stretchy jeans, so these pants look like real jeans, unlike the obviously-not-denim-from-50-paces 'jeggings' I've seen around. The only complaint I had with them was that they were a bit short for me. To be fair, I am a bit taller than average (5'7") & with my short back, a lot of my height is in the leg, so I can't usually get away with less than a 31" inseam. I prefer longer & I like the slightly bunched at the ankle look. Aside from the length, I fell in love with my new jeans. They were comfy & perfect for cycling--no worries about cuffs caught in my chain! They look great under boots in fall & winter. Probably the best thing about them is that after nearly two years of heavy use--I've practically lived in these jeans--they look great. They've faded naturally along the seams & thighs like normal denim does. The lycra (or whatever it is--I guess I removed the label, so I have no idea) isn't buckled or shredded anywhere despite being tossed in the dryer with everything else when I wash them. However, after about six months of wearing the Just USA jeans a lot, I started to notice fading & puckering. I nearly always air-dried them, though I'll be honest, they did end up in the dryer a handful of times. When worn, the puckering is stretched out, so it doesn't show, but the fraying at the seams is getting noticeable. I also find that the Just USA jeans lose their stretch & the knees get baggy after a few hours of wearing them, unlike the Old Navy pair. What I really wish is that I could get a hybrid of these two jeans--the durable material of the Old Navy pair, but the length & detailing of the Just USA pair. It makes me sad that the ones that are made in a first-world country & cost more are poorer quality. I didn't expect $20 jeans made offshore (again, not sure where, as the label's gone) to last a lot longer. I want to support companies that do business in countries with decent labour standards & I try to buy local when I can (the US is kind of more local than wherever the Old Navy ones are made), but getting substandard products for my efforts? That is disappointing. So in the contest between Just USA & Old Navy, Old Navy wins, hands down. Unfortunately, the style I bought is no longer available. I looked at other skinny jeans at Old Navy recently, but the colours & length deterred me from actually trying a pair on. I think I'll just keep looking for that holy grail of long-enough jeans that fit my bum perfectly & last forever despite being tossed in the dryer. Hi! When you say that you worn the USA jeans a lot, how many times (average per week, per example)? I use to buy expensive jeans (120 $ - Yoga Jeans - Second) and i am thinking that for a coral shade this summer, maybe i should give the first chance to the Just USA (which i never tried) because the price is ok. I am very interested to have receive your thoughts. Sorry, for my english... its not my first language! Hi Marie--my French is pretty rusty... sorry! I wore the jeans a lot--4-5 days a week, maybe? If you wear them less often, hopefully they'd last better. 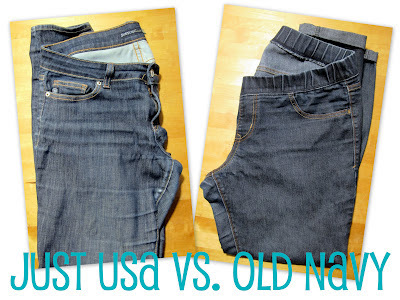 But I'd say I wore the Old Navy jeans just as often before I got the JustUSA ones & they wore much better. I enjoyed this post immensely dear. I think you approached the subject with both humor and grace, and don’t think you should beat yourself up about it. It was nice to see an honest review, without overly stylized pictures, of something we all wear on the daily.